The Montgomery County Solid Waste Division awarded the Centerville-Washington Park District a 2014 Buy Recycled Grant. 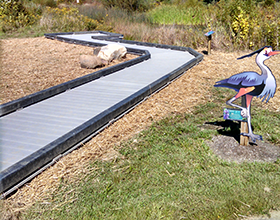 The Park District received $32,904 which was used to build a wetland boardwalk and observation deck at Oak Creek South Park. Materials used to construct the boardwalk and deck will be made of recycled content. Construction was completed by Park District staff. The boardwalk provides a stable surface for wheelchairs, walkers and strollers, allowing people to safely walk out over the wetland area to better view plants and wildlife. This project also provides new opportunities for environmental education and nature programs. The Buy Recycled grants enhance and increase recycling and waste minimization in local communities.